The physical structure of InnoDB’s INDEX pages was described in The physical structure of InnoDB index pages, and the logical structure was described in B+Tree index structures in InnoDB, and the physical structure of records was described in The physical structure of records in InnoDB. Now we’ll look in detail at the “page directory” structure that has been seen several times already, but not yet described. In this post, only COMPACT row format (for Barracuda table format) is considered. As described in the posts mentioned above, all records in INDEX pages are linked together in a singly-linked list in ascending order. However, list traversal through a page with potentially several hundred records in it is very expensive: every record’s key must be compared, and this needs to be done at each level of the B+Tree until the record sought is found on a leaf page. 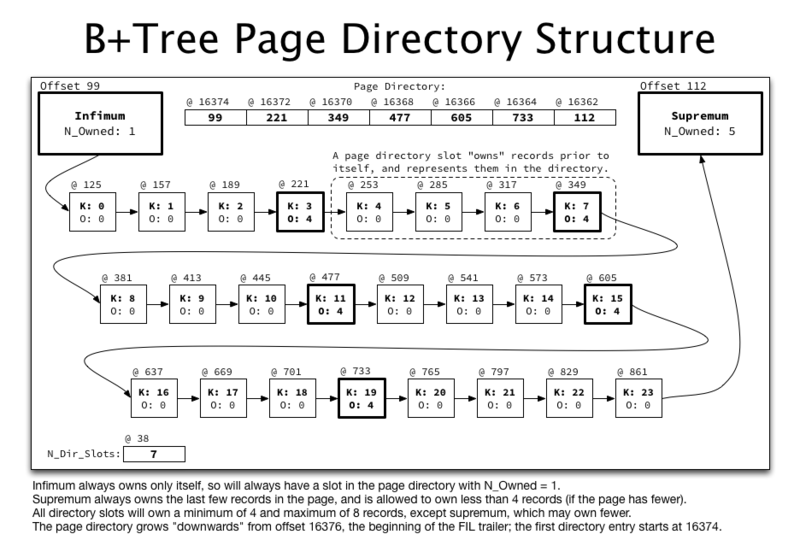 The page directory greatly optimizes this search by providing a fixed-width data structure with direct pointers to 1 of every 4-8 records, in order. Thus, it can be used for a traditional binary search of the records in each page, starting at the mid-point of the directory and progressively pruning the directory by half until only a single entry remains, and then linear-scanning from there. Since the directory is effectively an array, it can be traversed in either ascending or descending order, despite the records being linked in only ascending order. The structure is actually very simple. The number of slots (the page directory length) is specified in the first field of the INDEX header of the page. The page directory always contains an entry for the infimum and supremum system records (so the minimum size is 2 entries), and may contain 0 or more additional entries, one for each 4-8 system records. A record is said to “own” another record if it represents it in the page directory. Each entry in the page directory “owns” the records between the previous entry in the directory, up to and including itself. The count of records “owned” by each record is stored in the record header that precedes each record. The infimum record always owns only itself, since no record can have a lower key. The supremum record always owns itself, but has no minimum record ownership. Each additional entry in the page directory should own a minimum of 4 records (itself plus 3 others) and a maximum of 8 records (itself plus 7 others). Records are singly linked from infimum to supremum through all 24 user records, as previously discussed. Approximately each 4th record is entered into the page directory, represented in the illustration both by bolding that record and by noting its offset in the page directory array represented at the top of the illustration. 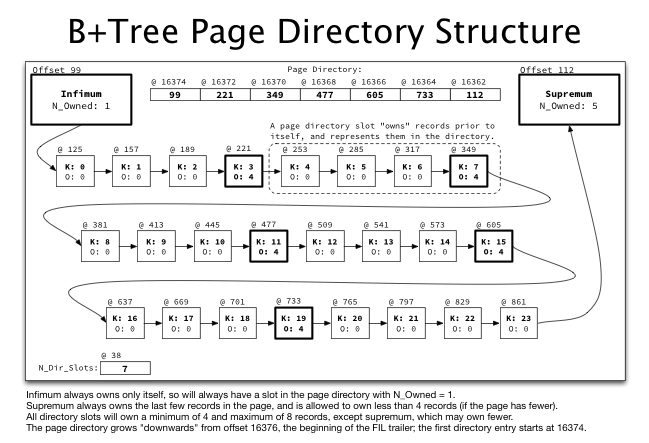 The page directory is stored “backwards” in the page, so is reversed in this illustration compared to its ordering on disk. index.linear_search(key) — Use only purely linear search on the singly-linked record lists to traverse the B+Tree. This is primarily intended as an inefficient counter-example to binary_search but is also useful to verify various algorithms (such as key comparison). index.binary_search(key) — Use binary search on the page directory and linear search as appropriate in order to search efficiently. This is intended to mimic (although not exactly) InnoDB’s algorithm for efficient search. Note that the key parameter to each method is an array of fields forming the key of the index (either primary key or secondary key). Start at the root page of the index. Linear search from infimum until finding an individual record with the highest key that does not exceed the search key. If the current page is a leaf page, return the record. If the current page is a non-leaf page, load the child page this record points to, and return to step 2. So this has compared 589 records’ keys in order to find the key we were looking for. Not very efficient at all. Binary search using the page directory (repeatedly splitting the directory in half based on whether the current record is greater than or less than the search key) until a record is found via the page directory with the highest key that does not exceed the search key. Linear search from that record until finding an individual record with the highest key that does not exceed the search key. If the current page is a leaf page, return the record. If the current page is a non-leaf page, load the child page this record points to, and return to step 2. In the above output you can see the directory size being repeatedly halved (dir.size), and the compared key (dir[x]) getting repeatedly nearer to the search key in the typical binary search pattern. In between binary searches you can see short linear searches once the nearest page directory entry is found (up to a maximum of 8 records). Especially notice that the compare_key operation is done only 40 times, compared to 589 times in the linear search. In terms of record comparisons, the binary search was 14x more efficient than linear search (and this will vary quite a bit; depending on the exact value searched to could be 40x better). Posted on January 14, 2013 by Jeremy Cole. This entry was posted in InnoDB, MySQL. Bookmark the permalink. I’m a little confused with the page directory implementation in InnoDB, why a page directory owns 4 to 8 records? In Oracle, it always owns 1 record per directory. For InnoDB’s implementation, I think there are two disadvantages: 1. binary search is a little slower. 2. Backward search is hard to implement. He: I think it comes down to two things: 1. conserving space in the page; 2. conserving log writes on insertion (for random writes, very many insertions can be done before the page directory must be re-organized). If the page directory were inclusive of all records, every single write would need to be be inserted in the correct position in the directory which would often have a cascading effect of shifting other entries around. I think that there really isn’t a cost in ascending-order search, as doing the last few comparisons via binary search vs. linear search has the same cost (and linear search can be cheaper depending on implementation). However you’re absolutely right about backward (descending-order) search, it’s much less efficient. I know InnoDB’s Page Directory Implementation can save space, but i don’t take into account the second opinion you proposed. These figures are great! Which tools do you use to create these high-quality graphs? Mi: I used OmniGraffle to make the illustrations. You reference describer_test.rb, where is that found? I think the Page Directory of InnoDB is not so well. when first search, we write the ordered list(singly-list) to page(because one page is 16KB, it’s very small, and is very colse to the transfer block size, so it’s fast), the second time you search it you can do binary search, so never need Page Directory. It it very helpful to understand PageDirectory and RecordHeader of Innodb.